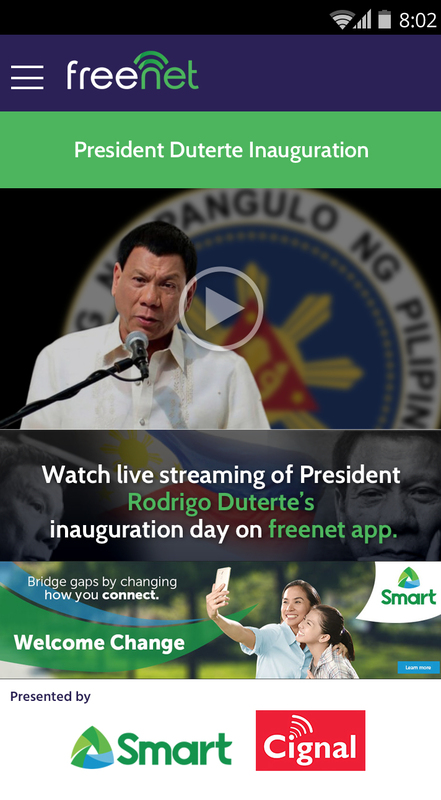 [28 JUNE 2016/ MANILA] - Filipinos will be able to watch the livestreaming of the June 30 inauguration of Rodrigo Duterte as the 16th President of the Republic of the Philippines, on mobile and for free. The occasion also marks the launch of the new freenet brand for Voyager’s sponsored data platform, previously called SafeZone. Through freenet, users will continue to be able to access select apps and websites for free by downloading the freenet app on their phones and never worry about unintended data charges. About 70 brands and enterprises are already using the freenet platform to allow their users to access their sites and apps for free. “Just a few weeks ago, we told our subscribers to ‘Welcome Change’. In the coming days, we’ll all be witness to the coming of that change as we welcome the new leader of our country. Smart is proud to enable Filipinos to digitally participate in this occasion using their mobile devices for FREE, through freenet,” said Ariel P. Fermin, executive vice president and head of consumer business at Smart and PLDT. “At Voyager we see a future with no digital divide, with each and every Filipino able to take part in the emerging digital economy. Giving them free livestream access to the next President’s inauguration is a step in our pursuit toward digitally enabling our citizens from today and beyond, through game-changing digital initiatives such as the newly rebranded freenet” added Orlando B. Vea, President and CEO at Voyager Innovations. Widely dubbed as the country’s first-ever “Social Media President” for having fully utilized the power of social media during the elections, president-elect Duterte is expected to break tradition as he assumes the highest post in the land inside the Rizal Hall of Malacañang, instead of the usual bigger location at the Quirino Grandstand. But despite having a more intimate venue, the incoming administration has vowed to let as many Filipinos witness the pivotal event with the aid of the same technology that helped Duterte get elected into office – social media. With almost half of the country having access to the Internet via their mobile phones, millions of Filipinos are expected to tune in as the country welcomes a new President. Aside from Duterte’s inauguration, June 30 likewise marks “Social Media Day” all around the world. In the Philippines, the occasion will be marked with a community event led by TweetUp Manila at the Samsung Hall of SM Aura Premier in Taguig City, a celebration supported by Smart, Voyager Innovations and PayMaya Philippines. With the theme “#TayoPH,” the event sets forth a reminder that social media can be used to bridge, to give a voice and to empower citizens--the way it did during the last elections.